The building’s basic configuration – a central core with a hipped roof, cross gables, and an asymmetric wraparound porch – is Queen Anne, as were many of the creations of architects inspired by the Richardsonian Romanesque style of the late 19th Century. This style was popular among the monied classes in Eastern Canada at the time – Timothy Eaton’s Toronto house, for example. Other evidence of the Richardsonian Romanesque approach is the rough-textured ashlar stonework that covers most of the structure, the round-topped arches over many of the windows, and the post-and-lintel construction of the porch with its squat columns and cushion capitals. Yet another style, Chateauesque, can be seen in the busy verticality of the steeply pitched, crested roof, with its many tall, narrow chimneys, candle-snuffer tower caps, corbelled eaves, and finials on the sides and tops of gables. The several dormer windows with basket-handle arches over them are another typical Chateauesque feature. This was also a favourite residential style of Eastern millionaires, with the Vanderbilt mansion Biltmore a notable example. The colonnaded loggia is a feature of the Italian Renaissance style. The 25,572-square-foot, 4½-storey building has 2,128 oak panels, 17 fireplaces, 87 stairs and 39 rooms. The castle was equipped with gas and electric lighting, hot and cold running water for indoor plumbing, a telephone and a burglar alarm system. It was set in over 28 acres of gardens, terraces, lawns, orchard and Garry Oak meadow. The sandstone was quarried in Koksilah near Duncan on Vancouver Island, fireplace tiles came from San Francisco, unfading red roof slate from Vermont, Gladding, McBean terracotta from California, and the oak staircase was prefabricated in Chicago. The total cost estimates range from $185,000 to $500,000. “Craigdarroch” means “rocky oak place” in Gaelic and it is thought to have been named for the Scottish marriage home of Annie Laurie. Robert Dunsmuir’s fortune, at the time one of the largest on the west coast, began in the coalfields of Vancouver Island where he toiled 15 years, after arriving from Scotland as a HBC contract miner in 1851. Legend has it that he promised his wife Joan a “castle” if she would come with him to Canada and she evidently believed him. In 1869 Dunsmuir discovered a major coal seam at Diver Lake near Nanaimo and set up his own company, Wellington Collieries. He later parlayed this into ownership or partownership> of shipping lines, the E&N Railway and Albion Iron Works. Robert Dunsmuir died on April 12, 1889, aged 63. By this time the Dunsmuirs had two sons and eight daughters, most of them already married with homes of their own. Elder son James (1525 Shasta Pl, Rockland) served as BC’s Lt-Gov in 1906-09. In 1890 Joan moved in with her three unmarried daughters and two grandchildren, including Elizabeth Harvey (582 St Charles St, Rockland), and lived there until her death. The castle became a hub of Victoria’s social life. One of the most lavish events was the 1891 wedding of Jessie Dunsmuir to Sir Richard Musgrave, an Irish baronet. The wedding was attended by 300 guests and the bride had 31 attendants. The Dunsmuirs had their share of family problems, with estrangements between Joan and both sons and a very complex financial situation when Joan died in 1908. The five surviving daughters inherited the castle but none of them was financially able to maintain the home and nor were any of them prepared to buy out the others. The estate’s trustees therefore decided to sell up. The house contents were sold at auction and the estate was bought by Griffith R. Hughes (1385 Manor Rd, Rockland). He evidently was only interested in the potential of suburban development, perhaps recognizing that the castle itself was something of a liability. Hughes subdivided the land into 144 lots plus a large lot surrounding the castle, but he had trouble finding buyers for any of them. He therefore devised a lottery system to attract buyers. Interested parties paid $2,750 for the guarantee of a lot, but with the actual piece of land decided by lottery. Buyers were also eligible for a second lottery for ownership of the castle. The lucky/unlucky winner of the castle was Solomon Cameron, who had earlier won Lot 13. Cameron owned the castle for several years but never lived in it and had no interest in it except as an asset on which to raise money. It sat in lonely splendour upon its hilltop, empty and neglected through the years of land speculation leading up to WWI. Cameron’s financial dealings did not go well and in 1919 the Bank of Montreal foreclosed on the castle’s mortgage. Thus began several decades of institutional use for Craigdarroch. The first lessee was the federal Department of Soldiers’ Civil Re-establishment. They set up a hospital for incurable WWI veterans who needed specialized long-term care. The Prince of Wales opened the hospital in September 1919, by which time the castle’s interior had undergone what the federal government called “a thorough renovation.” But by 1921 the government was reorganizing veterans’ hospitals into larger institutions. Victoria College, the forerunner of the University of Victoria, became the next tenant. Pierre Berton, a student here from 1937-39, famously carved his initials in the wood of the billiard room. Other distinguished alumni of Victoria College during these years were artists Bill Reid and Jack Shadbolt, and Dr. Frances Kelsey. A renowned pharmacologist who prevented the release of thalidomide into the US market, Dr. Kelsey was presented with the President’s Award for Distinguished Federal Civilian Service by President Kennedy in 1962. By 1946 enrolment at the college had led to serious over-crowding, due partly to returning WWII veterans. The building was considered to be a firetrap and a health hazard, and the provincial government moved the college out in 1946. 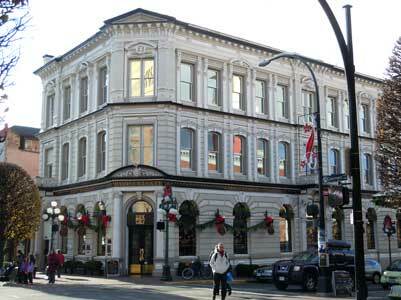 The Greater Victoria School Board bought Craigdarroch and moved its offices in. This required more “renovation” to create small offices out of the larger spaces used by the college. The school board remained at the castle until 1968. Craigdarroch then housed the Victoria Conservatory of Music until 1979. 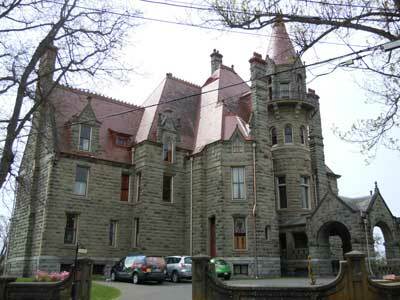 In 1959 a group of Victoria citizens formed the Society for the Preservation and Maintenance of Craigdarroch Castle, with a mandate to conserve the historic landmark and open it to the public. After the music conservatory moved out the Society moved into high gear with its restoration program. The castle is now owned and operated by The Craigdarroch Castle Historical Museum Society. The Society has acquired, by gifts and through purchase, many of the Dunsmuirs’ larger items of domestic furnishing, including Black Forest carvings, a number of gilt-framed oil paintings, the oak dining table and a variety of chairs, and a substantial collection of other Dunsmuir material. In the 1990s they began restoration of the drawingroom ceiling which had been painted over several times. The original artist is not known. It took 12 years to uncover the 1,000+ square feet of ceiling and frieze. 1999 saw the unveiling of a replicated art glass window in the drawing room. This replication was based on a long-lost photograph of the original, which was seriously damaged in a 1927 snowball fight among Victoria College students. The window is based on the painting Odalisque by Sir Frederic Leighton (1830-1896). A roof restoration project was completed in 2000 followed by an on-going program of sandstone conservation. Other conservation projects include the 18-foot retaining wall surrounding the south lawn and, recently, the third-floor bathroom. This bathroom had been altered in 1919 when the house became a veteran’s hospital and little remained of the original room apart from some piping and floor tiles. Nearby houses have been purchased by The Castle Society in recent years and this will allow for development of the castle and grounds. Among the plans are a visitor centre which will free castle rooms for restoration and visitor presentation. Craigdarroch consistently wins awards as the Best Heritage Site in Victoria and it is often used as a film location: Little Women with Winona Ryder, Claire Danes, Kirsten Dunst and Susan Sarandon, The Glitter Dome with James Garner, Margot Kidder and John Lithgow, and Spooky House with Ben Kingsley and Mercedes Rhule. There is a year-round program of drama and music and a large team of active volunteers, including docents. Annual visitation ranges between 120,000 and 140,000 people.